Samsung's new thin and light is curvier than most, but can it marry performance and stamina with those seductive looks? Can the Samsung SF310 really impress? Any new thin and light weighing in at £750 has a lot to prove in a crowded market. It needs to stand out stylistically, yet still offer strong value for money. It's not an easy task, because on one side you'll find Apple's impossibly thin MacBook Air redefining style, while on the other you have the ever-expanding glut of netbooks, typified by the likes of Samsung's own N230 proving that a little cash can go an incredibly long way if the right components are used. What hope is there for the likes of the SF310 then? What can it do to raise more than a passing interest? First impressions are positive – a run-down of the components list used in the Samsung SF310 will placate the techno savvy. The presence of an Intel Core i5 processor, Nvidia discrete graphics, LED screen and good storage options all quickly put to bed any notion that this is a trumped-up netbook. 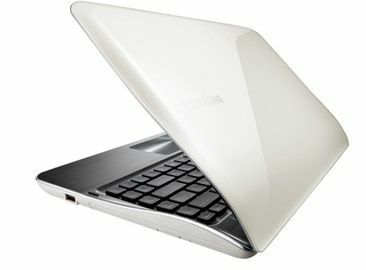 No, the Samsung SF310 is a fully fledged laptop, and it just so happens to be wrapped up in a delightly designed shell. The sculpted curves on displays may not be quite to Apple's Macbook Air levels, but this is a machine that celebrities won't be embarrassed to be seen holding.